Carolyn Leiloglou’s new chapter-book, Noah Green: Junior Zookeeper and the Garage Sale Pet captures all the enthusiasm, innocence, and unpredictability of first-time pet ownership in a winsome, charming debut. It’s instantly engaging enough to draw young readers in, but contains enough twists and turns to make the pages fly by. Leiloglou, a Story Warren regular, has been featured in Ladybug and Clubhouse, Jr, and Noah Green is her first novel, aimed at the 6-9-year old set. Protagonist Noah Green comes upon a mystery pet hiding under a ballcap at a neighborhood garage sale, thus dubbing her new friend Cappy. Believing at first Cappy is a guinea pig, Noah convinces her parents to allow the small pet to come home with her. Soon, however, Cappy begins behaving strangely – making un-guinea-pig barking noises, and happily paddling around a bathtub full of water. And, Cappy grows. And grows. As Noah and her parents begin to unravel the case of the garage sale pet, Noah learns more about animals and a bit about making tough choices. The section of the book when Noah is forced to choose between her own personal happiness and that of her new pet is particularly well-crafted, allowing Noah’s choices to feel significant, and helping young readers to see the value of sacrifice. 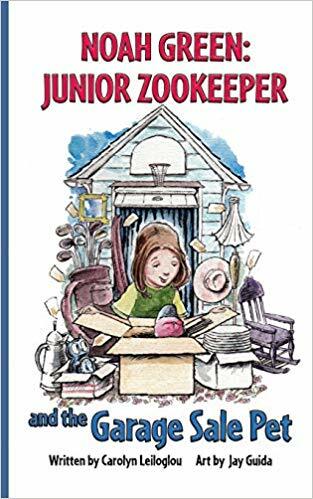 As a chapter book about curiosity, discovery, and being a responsible care-taker, Noah Green: Junior Zookeeper and the Garage Sale Pet is as brimming with joy and a fondness for God’s creatures as one could ever hope. A sneak peek in the back to a second Noah Green adventure is sure to be met with whoops of joy by readers who whizz through this installment. Noah’s the kind of girl who’s fun to spend time with!